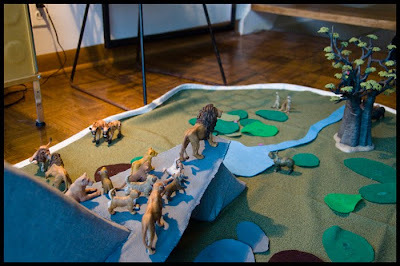 After my daughter went to see The Lion King musical with my mother-in-law last summer, I made the mistake of letting her watch the Disney version on DVD, and whatever crack the big D puts in its movies infected her completely and she quickly figured out a way to turn every game into something to do with Simba and Nala and the elephant graveyard. While there are toys for just about every other Disney movie still in the stores, I guess there was no princess angle to exploit with The Lion King because other than some crappy McDonalds happy meal toys I found on eBay there wasn't much to get her for Christmas that would ease her frustrations (she'd been playing Lion King with unicorns). So for Christmas this year we made her a huge Pridelands play set. For Pride Rock I cut a big piece of foam into the shape of the big rock and the smaller rock that the shelf rests on, then upholstered it in a basic gray. For the rock shelf I cut a couple pieces of cardboard into the right shape and then wrapped them in this rock-like gray leather that my dad had left over from when some Amish guys used to upholster the seats in one of the old cars he was fixing up. I had to hand sew that leather with a huge needle and it was not easy! 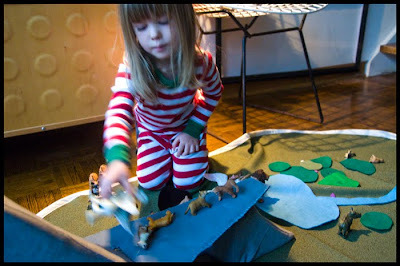 For the Pridelands themselves, we just took a big piece of thick green fabric and put some trim around the edges to make it a proper play mat. 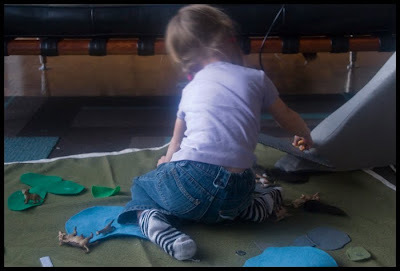 We ran out of time to make the stuffed-felt rocks, plants, and bushes like we wanted, so I just cut out some felt shapes and hot-glued velcro to the back of them (the velcro sticks right to the mat). 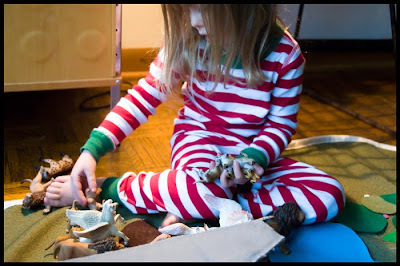 I bought her a handful of new Schleich and Papo lions and cubs for each character and even bought a meerkat, warthog, and a few hyenas (plus she already had a few African animals). The tree was the big splurge ($23); it's an African baobab made by Schleich. It's been all Lion King, all the time every day since Christmas. I also bought the boy some Schleich dinosaurs so that when she gets past all this, he'll have a nice Jurassic play set all to himself.